BCD. 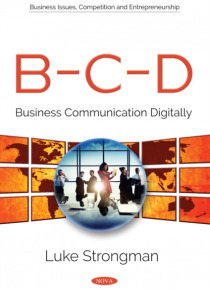 Business Communication Digitally is a book for today's and tomorrow's business practitioner and student that is structured into eleven chapters, each dealing with topics salient for aspects of business practice in the digital age. The constant need to innovate, to communicate ahead of time, to perform a service or supply a product on the promise of the future transaction, informs much about b… usiness practice. After all, what is business acumen based on but the difference between realities and contingencies, the tangible and the intangible? Most business communication in the digital world of today and tomorrow will either take place face to face or technologically mediated (by phone, email, video conference, text, etc.). More mediated business communication is taking place because of the ubiquitous availability of new distal technologies that are compatible with the office PC - social media, Skype, Yammer, etc. It is now possible to video-call a colleague almost anywhere in the world via internet connection. With the ubiquitous use of social media technology as one form of mass communication, social presence and media effects become relevant to mass communication that are encountered in the business world. The chapters of BCD are developed on a progression of themes. opportunity; creativity; equality and sustainability; negotiation; patience; listening; recognition; trust; intangibles; social presence; and digital media. These themes combine to engender a sense of situatedness in a world of doing.